You can read the screenplay for Whit Stillman’s Love & Friendship here (No longer available). It is being talked about for award season and has already been nominated for a Gotham Award. Whit Stillman’s Love & Friendship has people talking about potential Oscars for the film and its actors. Both Variety, Buzzfeed & Bustle have it on their lists for the Academy Awards. 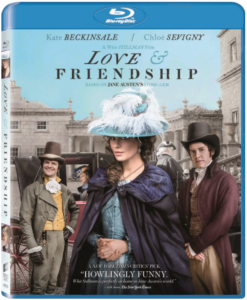 Love & Friendship is available on Blu-Ray & DVD. It is also available on demand. The novel adaptation can be purchased here. Whit Stillman’s Love & Friendship had critics talking (with a 98% Rotten Tomatoes score) and now with award season coming up, there is no surprise that it’s being talked about. Scott Feinberg writes for the Hollywood Reporter that Kate Beckinsale is on Oscar shortlists for her portrayal of Lady Susan in Love & Friendship.